Kaalakandi tries to show different perspectives present in the same city make it seem like a mash-up between Vantage Point and Project X, as a Saif Ali Khan who is tripping on acid tries to live his life post his discovery of the stomach cancer living in his body. The dark take on the "you only live once" ideology works well for the first half but seems stretched out for the rest. The country was taken by a storm when the trailer for Saif Ali Khan starrer Kaalkaandi was released in 2017. Delhi Belly scripter Akshat Verma’s maiden directorial venture was supposed to be a dark comedy where the lives of multiple characters went from good to worse in one night. The storyline was basic, the movie showcases three parallel tracks in Mumbai— a man who discovers he has terminal illness decides to let go of his principles and live a little; a woman involved in a hit-and-run seeks redemption and two goons must decide if they can trust each other. The movie hit the theatres on 12th January 2018(Friday) and an enthused group of watchers who were tired of seeing romantic comedies and dramas about family and friendship flocked to their nearest multiplexes and so did we. So here are the initial impressions of the movie. Akshat Verma tried very hard to be as edgy as Delhi Belly if not more but a wooden pot can only be used once. Even though there is a certain level of absurdism attached to the movie, the pacing is frantic and to be honest, those are the few things that work for the movie. 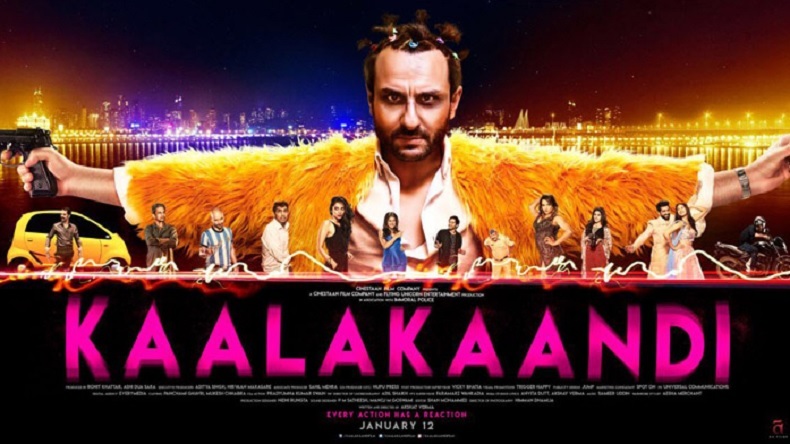 Kaalakaandi tries to show different perspectives present in the same city make it seem like a mash-up between Vantage Point and Project X, as a Saif Ali Khan who is tripping on acid tries to live his life post his discovery of the stomach cancer living in his body. The dark take on the “you only live once” ideology works well for the first half but seems stretched out for the rest. The movie sets out to be a one of its kind attempt on dark comedy but after 45 minutes, it loses focus. The editing does little to hide this flaw. The other two tracks fail to make the desired impact as they lack the ability to evoke humour, thrill or any emotions. There is no point in even talking about them because the director fails to tie them together or make any sense. Despite all its flaws, Kaalakaandi is a brave step for a mainstream celebrity like Saif Ali Khan during a time when most of the A-list stars have been reduced to a caricature of their previous self. We give the movie 2.5 stars, 2 for Saif Ali Khans groundbreaking performance and the 0.5 for supporting actors Vijay Raaz and Deepak Dobriyal’s performance which deserves an applause especially as newcomers in the industry.